Every girl is a princess and parents always want to give the best for them. One way of doing that is by giving them their own fancy and chic bedroom. 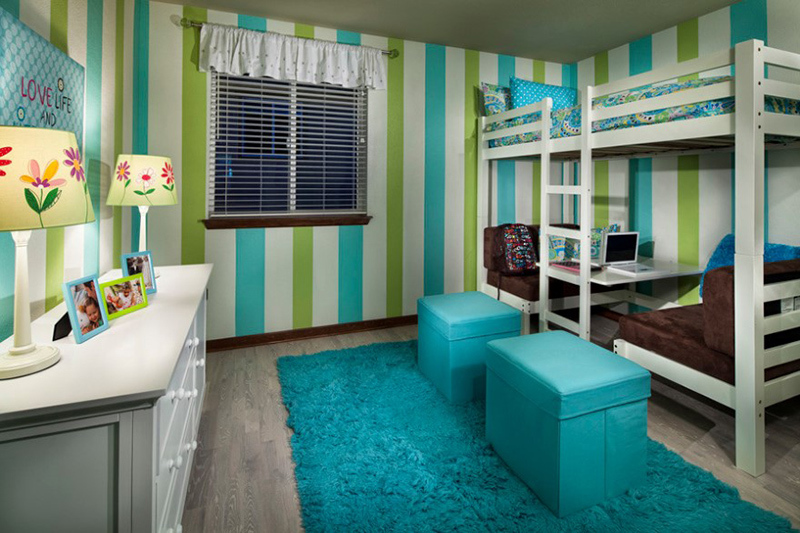 Although kids would ask for a princess themed room, others would still prefer one that is functional. This means that they can use it for everything that they want to do. What sort of things do girls love to do? Well, maybe arts and crafts, drawing, sewing, and many other hobbies. Of course, they want to have a space where they can do their homework. Giving them their own personal space will train them to organize their things and be responsible with their possessions. So, this is what we recommend for your girl’s bedroom. Get her a loft bed with desk. It is even better if it comes with a closet and drawers where she can store her own things. Don’t worry. It won’t occupy too much space. In fact, it is an ultimate space saver! From the name itself, it is indeed a cheerful room because of its choice of color. Just below the bed is a study area complete with drawers. It is also nice that this one overlooks the city. A vibrant red sofa chair is part of this set. It extends to provide the perfect guest bed for sleepovers. There is also plenty of study space with the fixed and extendable desk and ample storage with the over desk shelving unit and under desk storage cube. 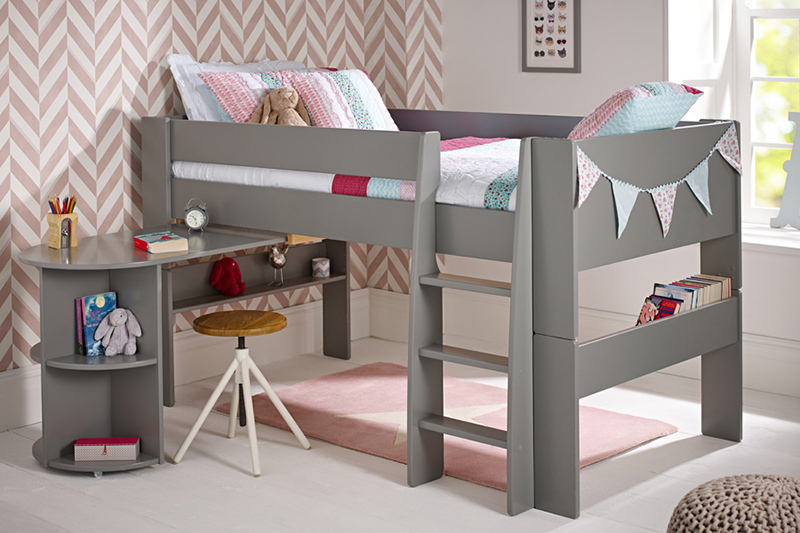 The loft bed is the perfect piece of furniture for your child’s room! It is constructed of poplar solids and veneers with a sleek gray finish. It includes a 4 drawer chest end on the twin loft, and a six drawer dresser end on the full loft. This bed has everything you need in one charming package featuring a compact desk with ample storage space under the loft bed. It also includes shelving on both sides and a sturdy dovetail drawer that glides out smoothly. Well, if you don’t want to make the colors appear very girly, you can have one like this combining gray, white, black and red. This room actually reminds me of the Queen of Hearts! 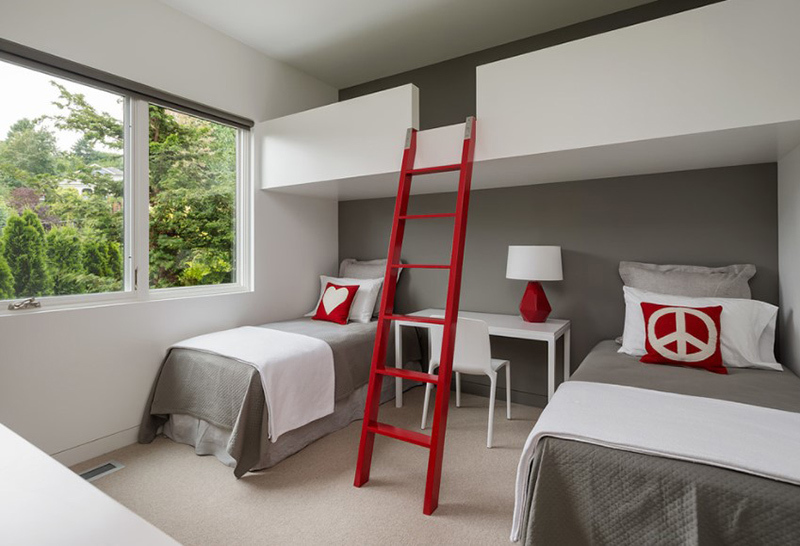 A contemporary kids’ room with an orange and white loft bed. The wide mirror on the wall makes the space appear visually larger. With a charming design and beautiful fresh white and lilac finish, this one is indeed a real eye catcher and is perfect for all ages. The corner wardrobe, bundles of shelving space, and the sizeable dressing table with a mirror and swivel drawer is great for storage solution. A timeless beadboard loft expertly crafted by engineers to ensure the highest standard of safety and stability. It has a full bed up top, a spacious desk with cabinet and a dresser below it. A girl’s bedroom with a traditional appeal. Aside from a desk, it has many storage areas and a space for playing too. Pink and lime green looks great together just like what you can see in this bedroom. Under the bed is a desk good for two people while on its side is a tall storage space. Aside from the colors, I love the patterns in this bedroom. According to the owner, it is so easy to convert between a bed and a table. Who will not fall in love with this modern sleek loft bed? Its neat lines create a clean effect to the interior. And of course, we love the colors and that heart-shaped rug! This one can also provide some play space for your little girl. The study space below it looks really busy with notes and calendars on the wall. This is ideal for girls who go to school and needs to organize their schedules. Its sleek, modern design and neutral color palette make this bed perfect for growing with your child. The simple lines and exquisite details displayed within this contemporary furniture collection make it look even more beautiful. If you have a toddler, these bedroom ideas will be perfect for her! Beautifully built with four times the functionality for sleep, study, store and style all in one place! Get a sleek loft bed like this one so it will fit the modern appeal of the bedroom. Of course, do not hesitate to decorate it with things that you like the most. This way, others can see your kind of personality merely by looking at your room. A mid-sized Scandinavian kids room with white walls and light hardwood floors. Love how different colors were added to this bedroom despite the simple design of its loft bed. Apart from an all white midsleeper frame, it has a fantastic roll out desk that can be neatly tucked under the bed when not in use. There is also a 3 drawer chest that is used for keeping clothes, games or toys. The splash of color in Lime and Grey brings a true designer feel to any bedroom. This midsleeper with pull out desk is another fabulous contemporary bed. This bed can also split down to a standard single bed if required at any time in the future. This one is an ideal choice for your child’s bedroom as it practical and has a bookcase to tidy away books and toys. It can also be converted to a bunk or high sleeper with the addition of a building kit. If you are looking for the ultimate sleep, study and storage bed, you will definitely get one from the list we have today. And this will also inspire you to use this type of bed for your girl’s bedroom because it occupies a small footprint while offering many different functions. Of course, do not skip the decorating part because this is what makes every girl’s bedroom fun and beautiful. 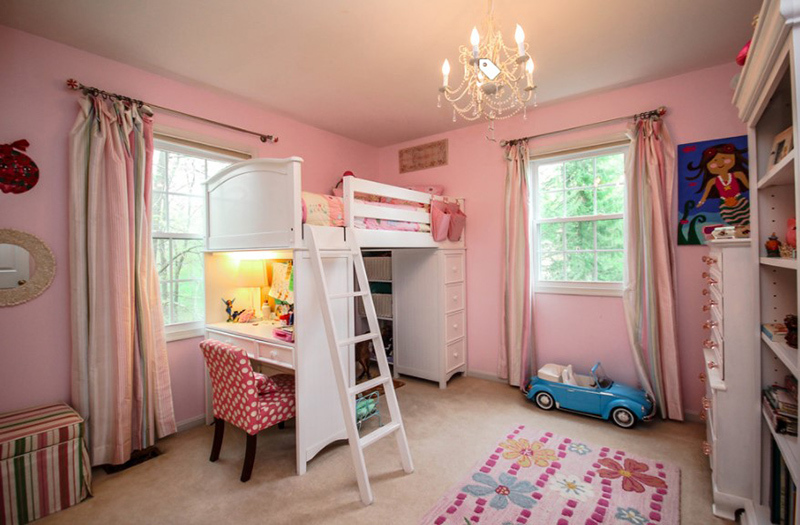 Which of the above loft beds with desk will your princess like the most? 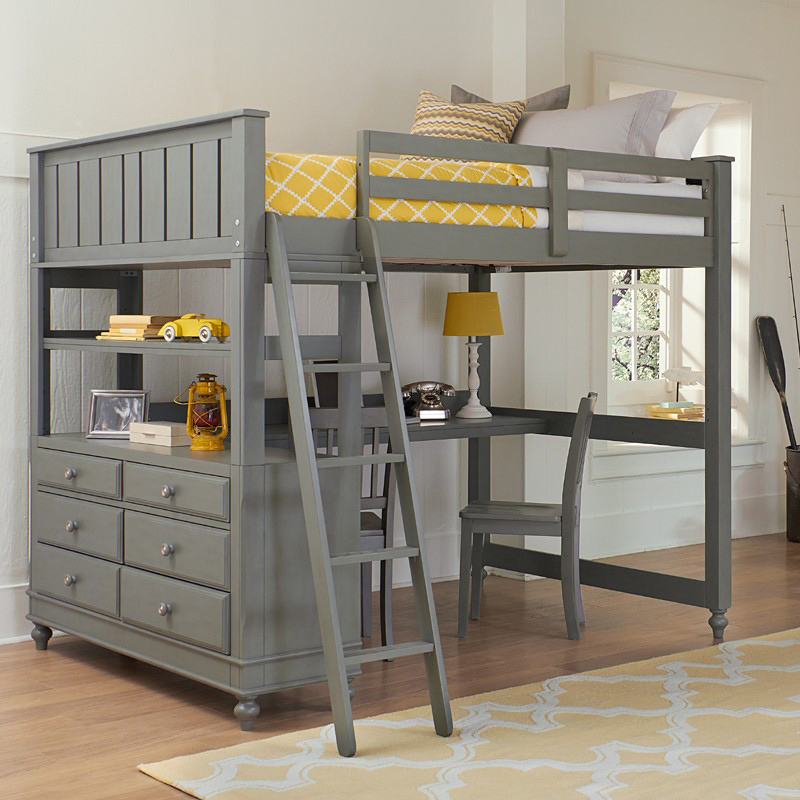 Before you go, check out loft beds with desk for your boy’s bedroom. I just found the bed that I want for my daughter. Thank you for this article. I absolutely love these beds. I wanted one of these with the desk underneath so badly when I was a kid. lol. I always love this style It save so much space and look so much better. I love all of these great styles. I wish I had these kinds of bed when I was little. Great share! Excelsior- Siesta Key Beach Condo is my fave! Woow..this is such a great idea and very compact way to decorate the room when the size of room is small. What a lovely post! I really love the grey and blush tones at the moment so some of these are right up my street! Wow these are amazing rooms. Would’ve loved a room like this when I was a child. They are so well organized.